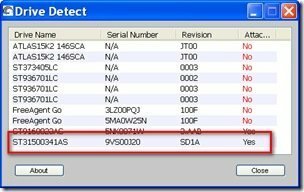 A number of Seagate hard drives manufactured through to December 2008 may become undetectable by the BIOS after a system re-boot. 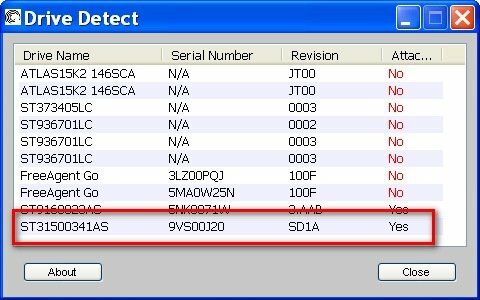 The issue is due to a firmware bug and is affecting some Barracuda 7200.11, DiamondMax 22 and Barracuda ES.2 SATA hard drives. Your data is not lost and still resides on the drive, but you can’t get it back without specialist hardware. In extreme cases data can become corrupted, and in this case Seagate will provide free data recovery services and work with you for a speedy remedy to minimize any disruption. New firmware to correct the issue has been available, but the firmware SD1A was taken down due to reports of the firmware update ‘bricking’ numerous drives, especially the smaller 500GB drives. New firmware for all 21 affected models is still being validated whilst testing is still being undertaken but should become available soon, but In the meantime make sure you have backed up your files somewhere else. Support is available through Seagate’s call center on: 1-800-SEAGATE (1-800-732-4283) and you can also expedite assistance by sending an email (discsupport@seagate.com) with your affected drive’s model number, serial number, and current firmware revision. UPDATE: You can also check the various threads in the Seagate Community Forums for additional help and information and the following placeholder for the firmware here. Be careful when updating your firmware, as it’s been reported that the updated firmware (which was issued to fix the original problem) has resulted in problems for owners of the 500Mb Seagate Barracuda drives….and you’ve guessed it, are awaiting an updated firmware to fix this new problem! I checked January 21st and the updated Seagate firmware was not available for the 1TB Seagate drive that I recently installed on my homeserver. I checked again tonight (January 23rd) and the firmware is there now. My question, does anyone know how to update the firmware on a drive that is part of my HP Windows Home server pool? I am also looking for a way to update my drives (2 1TB) in my HP Home Sever. Any suggestion?